1) Fireplace gate hanging — the gate with original hinges is from my fiancés’ parents’ old house. He grew up in the house in Kirkland, and I took some items before it was sold and torn down, not knowing what I was going to do with them. 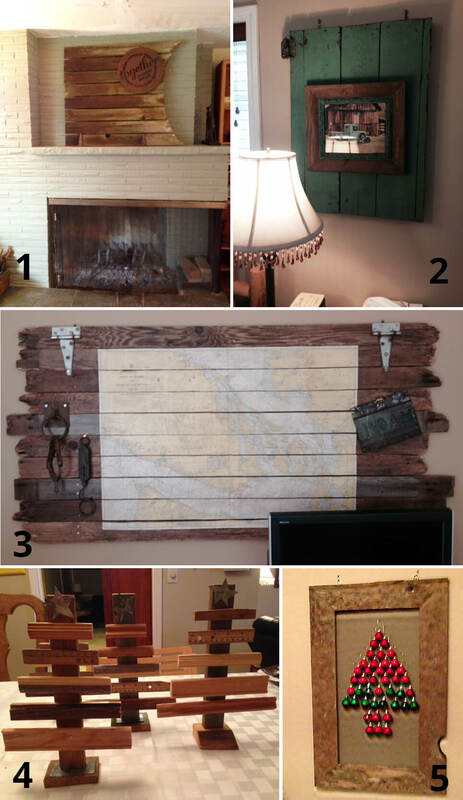 Once we moved into our new house, I saw on a TV show the idea of using a piece of gate as a wall hanging, and spiffed it up, mainly wire brushed it. My son had given me the rusty sign as a gift a while ago, which I thought was a good compliment. 2) Wall hangings for the bedroom (one shown here) — I had found the turquoise old gate pieces at a garage sale a couple of years earlier. I decided to hang them on our wall, cut one down to size so they matched, and left the old hinges on them. I found some old farm pictures that I framed with old looking frames at Michaels that happened to have a great turquoise rim, and attached those to the gate. 3) Map wall hanging – my fiancé likes maps. We had one of the San Juans, so I stained it to make it look old, pieced together some old cedar fence pieces, and then added some old hinges and a few other rusty items. The ring was a piece from my fiancé’s cabin in Cle Elum off an old post. The metal piece I bought at a salvage store, and the other pieces were found at a junk fair in Ellensburg. I then cut the map into pieces and decoupaged to the wood. 4) Christmas trees – again, I saw a different version of this idea somewhere as a wall hanging, and for Christmas gifts I decided to make smaller ones on stands out of old molding we had, old wooden rulers I found at garage sales, and pieces of driftwood. I cut the stars out of a piece of galvanized metal HVAC piping that I had lying around. 5) Christmas balls – I saw this idea at an antique store, and made my own frame out of old cedar I had collected, then added some old screen, and the balls. I can put other things on it for other holidays.